It's that time of year when change happens. The days are getting much shorter. They are about to get shorter still when we go off Daylight Savings Time this coming weekend. The weather is getting colder. The leaves are falling off the trees. Most of them are down now, and I expect the rain that comes in a couple of days will remove most of what's left. Winter won't be far behind. As a painter, this combination of events has many repercussions. 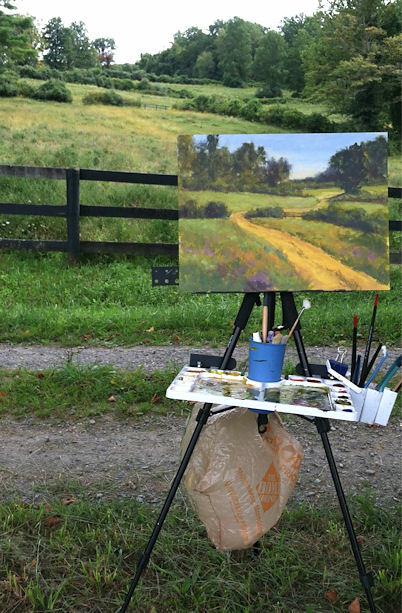 I'm touching up plein air pieces that have been done over the past three seasons and not yet quite finished, picking out the bugs and blades of grass and bits of sand and dirt, and getting them ready for holiday sales. 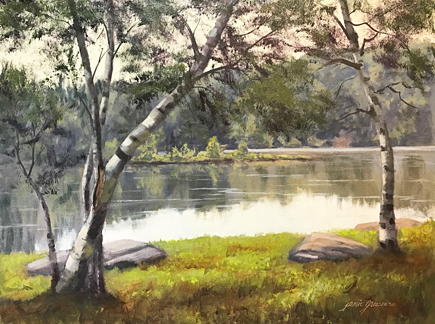 I'm varnishing and framing a lot of paintings (just varnished 21 pieces a few days ago), and getting them to the galleries for the holiday shows. I'm preparing for The Big Move into the studio for the winter. I actually look forward to this annual change. It gives me a chance to dive into other subject matter that I love, but don't have time for during the seasons of better weather. I have an opportunity to listen to great music while I work in the studio, tackle some larger pieces, and do my commission work. 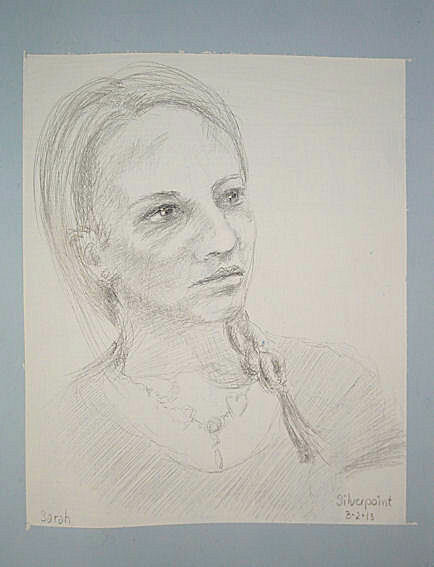 I can get back to open studio figure drawing and painting, portraiture, and mix it up with a bit of still life. I experiment with materials, new color combinations, and explore style. 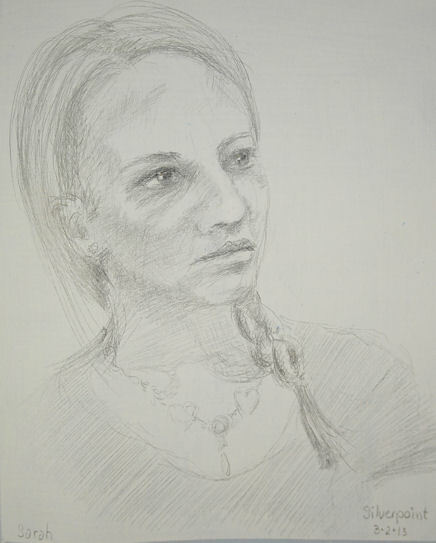 I anticipate it won't be long before our plein air group starts our regular winter portrait sketch-a-thons. We gather in somebody's house and take turns doing 20 minute portrait sittings for one another. It's great fun, and we don't have to pay a model! I like to do some sketches from photos as a warmup for the seasonal change. This week I've been focusing on eyes. I'd like to improve my ability to capture expression this year, and a lot of that happens in the eyes. I'm not doing any underdrawing, and just going in directly with a brush and watercolors. After doing the first few, I got frustrated with my palette, added some colors and swapped out others. I'm finding I need a slightly different selection of pigments for portrait work. Mainly I really missed my cadmium red and cadmium orange. 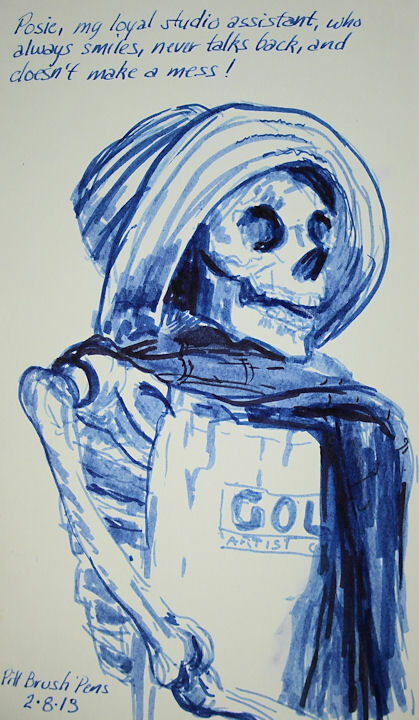 I'm also liking ultramarine violet, and sometimes cobalt violet. I took out the phthalo blue, kept cerulean and ultramarine, and added cobalt. Getting back to my winter fare feels good. I'm looking forward to diving in more as the weather gets colder. I feel inspired by the change. My pet birds, Mango and Coconut, will be happy to have me back in the studio. The dogs' beds are already under my work table. Bring it on! Every once in awhile, we need to just throw paint. That's what I was in the mood for when I did these two acrylic sketches! 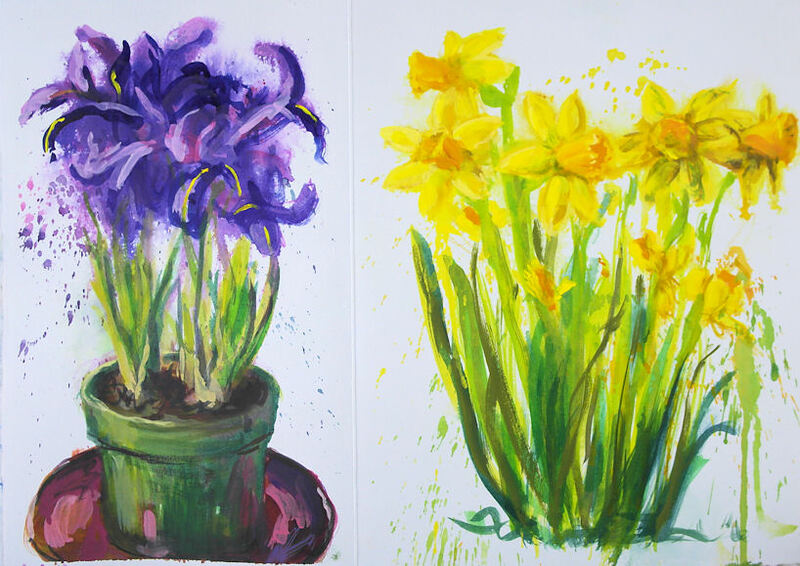 They were done from life, from potted plants in my studio. I let the paint spatter and drip, painted into it, made some drips, and just kept doing that until I had enough! This two page spread is about 14x10" in my homemade blue Pescia journal. It was painted with the same Golden Airbrush paints described in my previous post, as well as some Golden Fluid Acrylics for a bit more body to the paint. I still have two blank pages to fill in this journal. I think my "Kinda Blue" theme played itself out. I was ready to be cheerful by the time I got to the paint-slinging phase here! I will definitely finish it up though as soon as the desire to sketch on something blue surfaces. Thank you for following along through this journal. 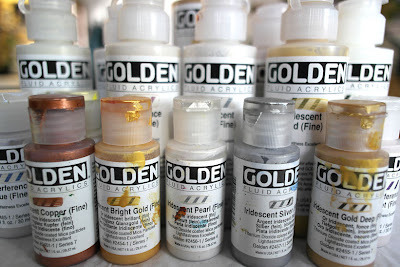 This week I'll be posting my review of the new Golden High Flow acrylics. A good friend sent me flowers for my birthday during the time I was working my way through this journal. 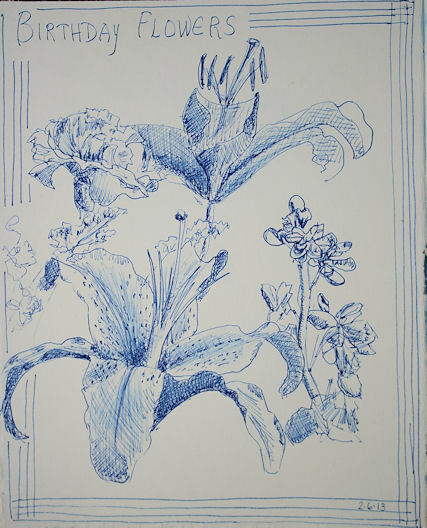 In sticking with my "Kinda Blue" theme, I did a blue-on-blue sketch of some of the flowers, using Noodlers Luxury Blue ink in a Lamy Safari fountain pen. When I was finished, I took a fairly stiff brush to the flowers to brush out some shading color from the lines. This ink is fairly waterproof, but you can get a little color to move on it, which I find useful, especially when working in monochrome. I was continually impressed by how well this printmaking paper handled assorted media. In spite of little sizing, the ink did not bleed nor feather, and painted pages dried flat. Now that I've gotten into monoprinting, I've been doing some prints on it too. Great stuff! I didn't think I'd like blue paper as much as a warmer color, but it surprised me. This is a 10x22" spread across three pages in my blue Pescia journal. You can click on it to enlarge the image. (Here is a link to how I made this fabulous 16-page journal from a single sheet, in case you missed it.) It's a scene from Dennings Point Park facing downriver through the Hudson Highlands, with Bannerman Island showing on the right side, just in front of the mountains. I had been wanting to paint this for so long, and will probably do a larger version to frame and hang in the near future. This painting was done with traditional brushes, but I used the Golden Airbrush paints to do it. 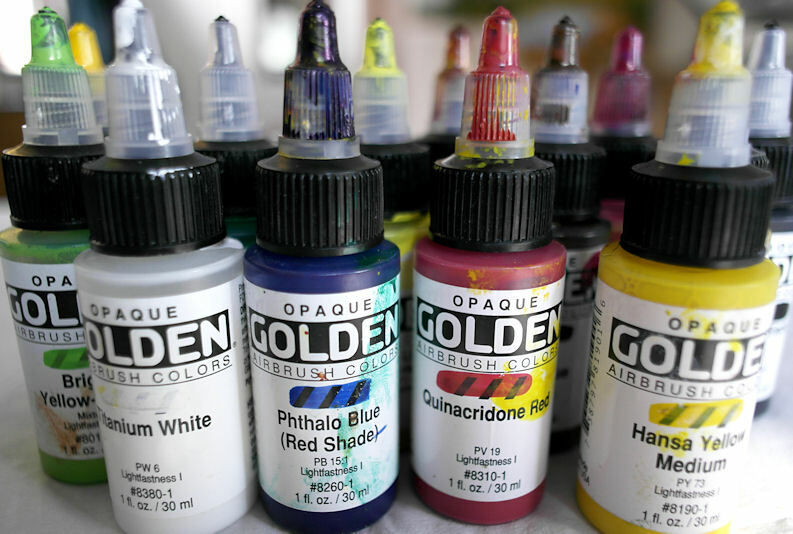 That line of acrylic paints has been reformulated, and has just hit the market as the new Golden High Flow line. I ordered some as soon as they became available, and was delighted to see the color range expanded to include some colors that I sorely missed in the Airbrush line. I have the new paints here now, and will be posting a review of them next week. One of the things I experimented with in this blue Pescia book was silverpoint. Doesn't silverpoint have to be done on a hard surface with extensive preparation? Not anymore! Golden makes a Silverpoint Ground that I decided to test drive. I taped the edges of the page and gave it a couple of coats of the Silverpoint Ground. My daughter posed for me, and I sketched this in 20 minutes or so, using a silver stylus. I was really surprised by how well this technique worked out in a sketchbook! The page is 8x10", and the silverpoint sketch portion is about 8x6.5". This three page spread is about 10x22". I didn't take photos of the individual pages, but you can click the image to get a much wider, clearer view of it. It was done around Valentine's Day, hence the hearts on the left. Those started out as red paper heart doilies. 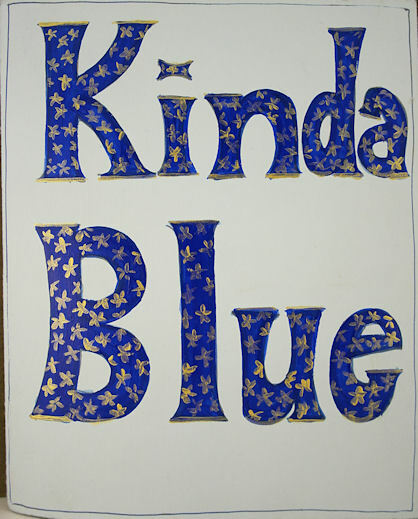 I cut out parts of them, painted them with blue acyrlic, and decorated with a gold leafing pen. The paper snowflake on the right was cut out from blue patterned origami paper, which I then added to with gold paint. It was a memory of Sandy Hook and all the paper snowflakes that I made to send there. In the center of the three page spread is a poem about snowflakes by Henry Wadsworth Longfellow. I copied it over and then painted over it with some glittery Mod Podge stuff, just to see what it would look like since I'd never used it. I kind of like it! I'm thinking I might paint over the cover of this sketchbook with it, since it's a polymer that would also protect the book. This is the blue Pescia, 16-page journal that I discussed in yesterday's post. The sketch above is Posie, my studio assistant, rendered directly with blue Big Brush Pitt Pens by Faber-Castell on heavy Pescia 100% rag paper in a delicious light blue color. Actual size is10x6". I'd always wanted an anatomical model from which to practice drawing in the winter when I don't have a model around. Posie has filled that role nicely. The full size artist anatomy models are hundreds of dollars, so when I saw five foot Posie in a Costco display around Halloween for $38, I brought her home with me. In the cold, dark and dismal days of February, I made a separate sketchbook out of the blue Pescia paper to work out my winter frustrations for a couple of weeks, and I titled it Kinda Blue. 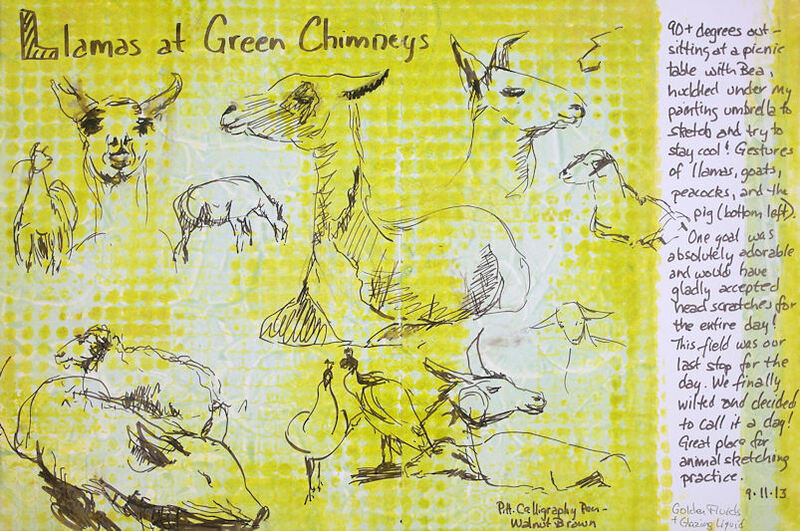 This is one of my favorite drawing and printmaking papers, but during the course of completing this sketchbook with experimental this-and-that, I learned to love it for many other things too. These little books could never replace my hardbound sketchbooks; they are more like "special project" booklets. They come in handy for traveling when you can't lug a heavy sketchbook, and want a separate memory of a short trip, or if you have a special sketching project in mind that would be less than 16 pages. The book is very versatile, and you can build in various pockets using the fold-out sections if you have things to store from a trip, such as post cards, photographs, tickets, receipts, and notes. I used a couple of small pieces of the Pescia paper to make color notes and test assorted media. Then I made a pocket with the front flap and used it to store them, so I would have them for reference while I worked through the book. Those note cards came in handy to remember what materials and specific colors I used for the sketches. 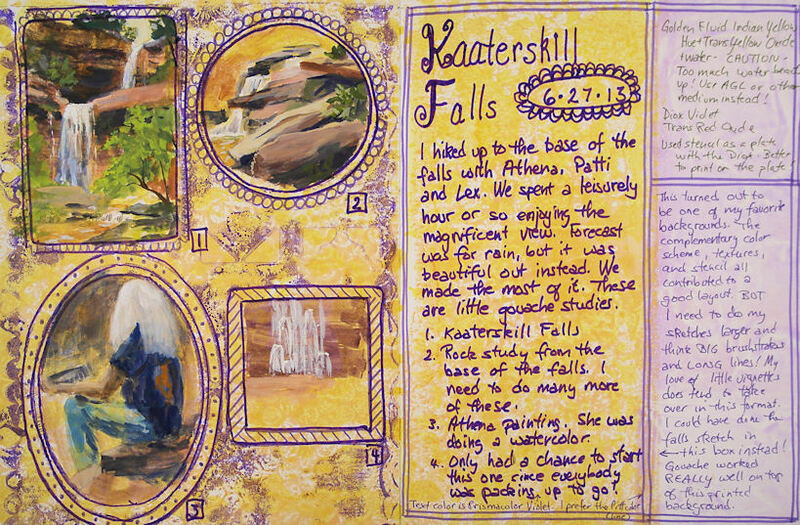 A few days ago, I hiked up to the base of Kaaterskill Falls with some friends for an hour or so of sketching. I had previously done a multi-layered monoprint across this two page spread in my Stillman & Birn Zeta hardbound book. The little picture area borders were printed at that time (and later embellished with markers), so I used them to make vignettes of scenes at the falls. The first one, on the upper left, is the grand view of Kaaterskill Falls, which is the tallest waterfall in New York State, and appears in many Hudson River School paintings. The little round sketch to its right is a rock study. Rocks give me a wonderful way to examine how value and color change as the form turns toward and away from the light. 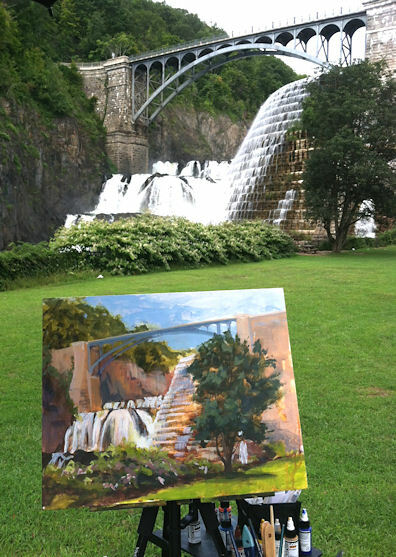 The third little sketch (the oval) is my friend Athena, who was sitting next to me painting the falls in watercolor. The last tiny sketch is unfinished, because everybody was packing up to go at that point. I tossed all my stuff into my backpack and we hit the trail! These were all done in gouache over the acrylic background. 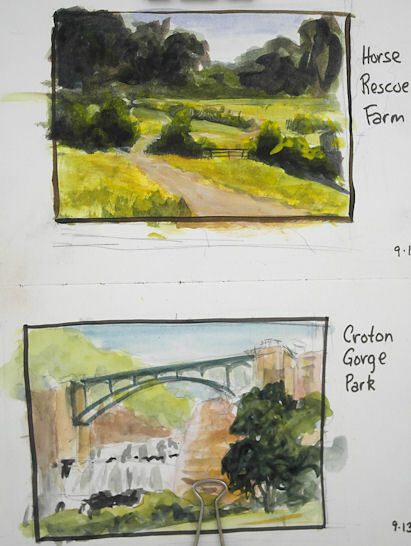 I often practice sketching items from photos that I have to be able to pop into plein air paintings quickly. This includes figures, boats, bicycles, cars, trees, rocks, etc. One rainy day, I decided to do some boat sketching. I first searched YouTube for any new tips on sketching boats, and came across this interesting video on how to make boats from a figure 8. 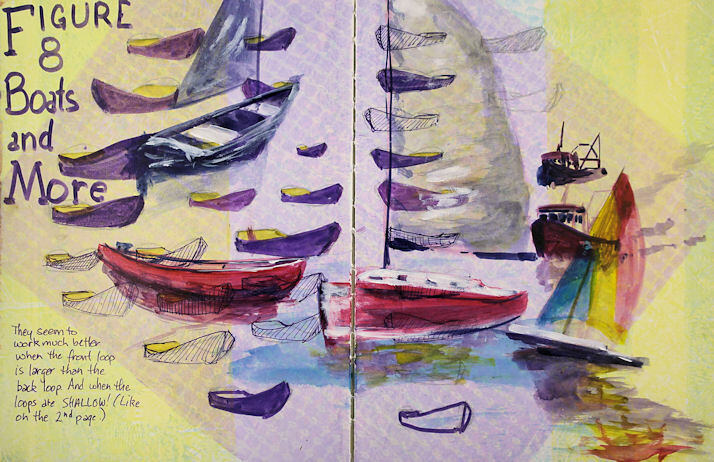 I started the page spread by experimenting with the figure 8 boats in the video, facing them in different directions. I tried them slightly larger and slightly smaller, varying the sizes and widths of the loops to find what would work best. What I found was that the figure 8 boat sketches are fun and kind of interesting. But it wasn't long before I saw that it only gave me a certain amount of perspective variation and boat angles, and applies to very few cases of actual boats I'd be painting. However, it did give me a feel for roundness and overall shape that I found useful. Once I'd gained what I found to be helpful from the video, I did some larger boat sketches from photos that encompassed other angles and drawing approaches. 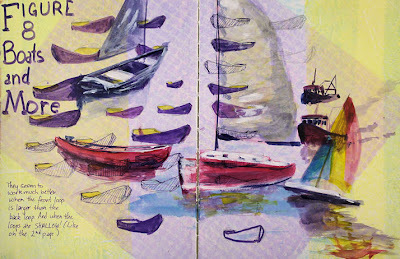 I'll probably add a few more to this page spread the next time I want to practice sketching boats. There's been a lot of buzz out there lately about the new Gelli Printing Plates, which enable artists to use traditional acrylics to create monoprints inexpensively, and without a press. I had to get on board that train! I ordered the largest size available, which is 12x14". As soon as it arrived, I dove in. My goals were to create textured backgrounds for artwork using monoprinting techniques, as well as traditional painting on the plate to directly monoprint a work of art. I've always loved sketching on a prepared ground. I often pre-toned my sketchbook pages, or layered on textures using assorted tools. I've seen many YouTube videos where artists monoprinted the full sheets of paper, then made sketchbooks out of it to get the prepared grounds. Other videos and blog posts showed printing in a hardbound book, using one side of a page at a time. The problem with either of those methods is that the left and right sides are from different prints, so they don't match. I almost always work across the spread in my hardbound sketchbooks, so that approach was not going to work for me. Stillman and Birn to the rescue! Because their hardbound sketchbooks are designed to open flat, I thought they might enable me to print right across the spread. I opened up the book and pressed it flat down against the printing plate. And guess what. It works! Furthermore, since I was printing the background and not painting it, I didn't have problems of paint running into the gutter of the book and discoloring other pages. Above is an 11x17" page spread of an 8.5x11" Stillman and Birn hardbound Zeta book. (It's about four layers of prints.) These new smooth surface books with heavyweight paper are ideal for monoprinting. Who knew! These will be fabulous backgrounds to paint and sketch on now. Below is one of my personal favorites. It was done as two printings --- the first with diluted Cerulean Blue, and then a layer of Transparent Red Oxide mixed with a little Iridescent Copper. It has a very subtle sheen, which is not visible in the digital image. I'm looking forward to working on these prepared pages soon! Why the Gelli Printing Plates are made in sizes 6x6", 8x10" and 12x14", I'll probably never know. Paper is sized 8.5x11, 8.5x17, and 11x17, or in the fine art full size sheets of 22x30 (which quarters to 11x15, and 1/8 would be 7.5x11). Therefore, the Gelli Plate sizes do not allow full use of plate nor paper. This is why there are side stripes on some of these page spreads that I printed. I tried to make the best of it. I kind of like them, and I can use them for writing text. For some of the page spreads I printed all the way to one edge, allowing the print to overlap the gutter and leave me with about 3" of unprinted space on the opposite side. Then I could either print that space separately and use it as another graphic block, or I could use it for text to accompany whatever artwork I ended up doing across the spread. I didn't take photos of those yet, so I suppose those will make their debut once the artwork is done over the top of the backgrounds and they become finished pages. However, I wish I had the option of printing across the full two sketchbook pages, and I also wish the plate would accommodate the standard 1/4 sheet size of 11x15 when I use rag paper. The awkward 12x14 plate size misses the mark on both. When ideas are brewing in my head, it often takes awhile for them to emerge as finished paintings. I often play with those ideas in my sketchbook at night, or in a small format on loose pieces of paper. I had some color ideas I wanted to explore last night, so I pulled out my little half-pan watercolor travel setup for these, and used squirrel mop and sable brushes. I usually keep a few pieces of good rag watercolor paper taped to boards and some are subdivided for sketches like this. Setting up a sheet this way is something I got from a workshop I took with the amazing David Taylor. He always advised doing these small thumbnail sketches on the side of the page in a small taped-off section. That way you can test drive your ideas (a few times if necessary) before taking them to a larger version. It speeds the process along, and you can immediately apply what you learn to the next one. I was torn between working in my sketchbook and working on the rag paper. 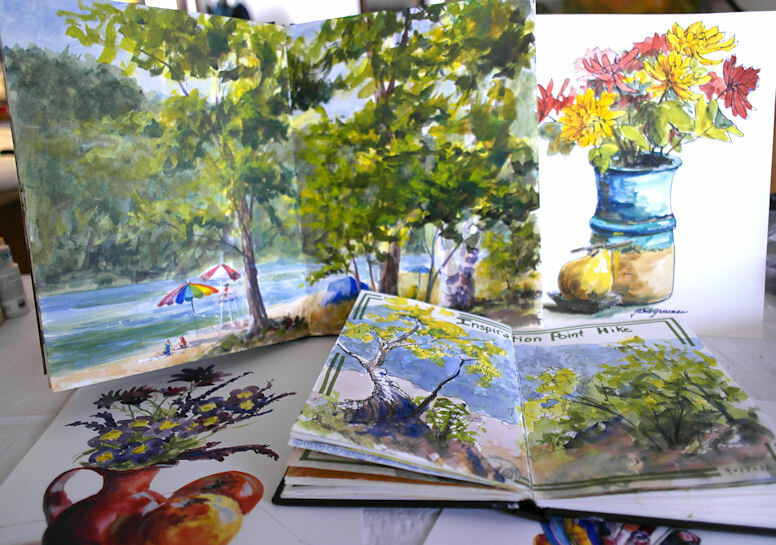 (I love the way a hardbound sketchbook keeps all my ideas from wandering away!) 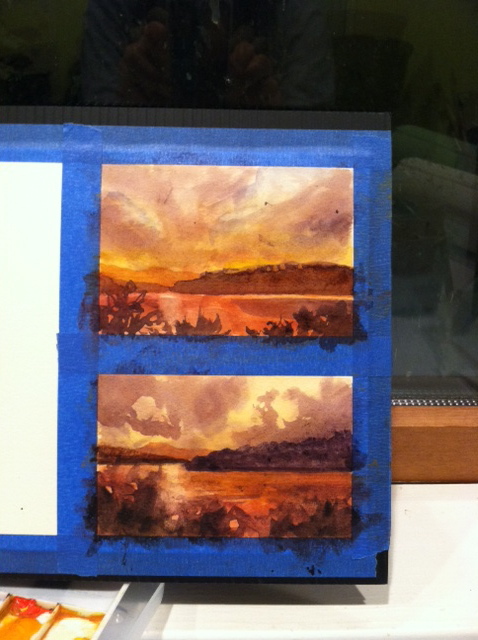 But in this case, I needed to see how the colors would blend on rag paper. Technically, I'm not too pleased with these. However, I am happy with the way the colors are working, and I think with some more practice I'll be able to get what I'm after. Then I'll scale them up and start exploring the idea with assorted materials and techniques. One thing I've had to accept over the past few months is that the way I'm wanting to work with watercolor and acrylic requires a larger palette for those media for wash mixtures. It's always a juggling act to try to determine how much stuff we can take out painting on location, considering the need to pack light and carry it all! I was sitting in on a court case today and had my first-ever opportunity to sketch in a courtroom. I arrived a few minutes before the first case was called, so I did the quick sketch above to feel out the lay of the land and get my bearings. I used a Pentel Gray Aquash brush pen for all of my sketching today. 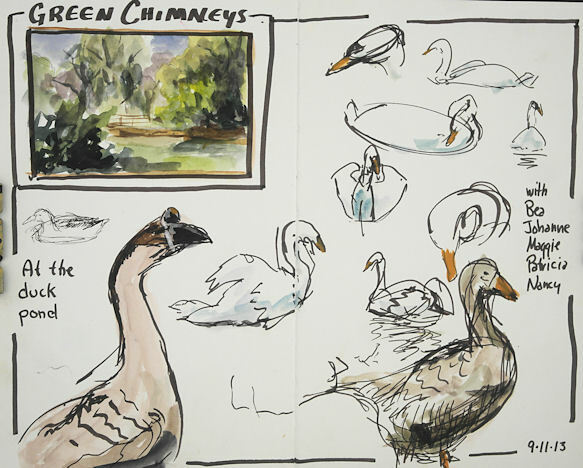 The sketchbook is one of the new Zeta hardbound books from Stillman & Birn. Going right in with an ink-filled brush is really my favorite way to go about this kind of thing, especially on this smooth Zeta surface. 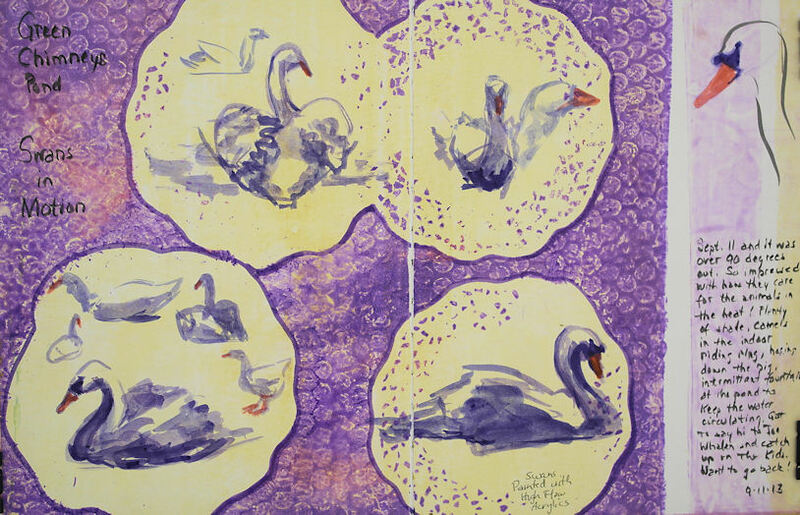 The two facing pages of this spread had been slightly toned with a warm-colored watercolor wash several days previously. I laid in a bit of color after I got back home just to liven it up a little. This was the Albany City Court building. I wouldn't have minded an entire day there just to sketch architectural elements. The hallways were filled with magnificent marble arches and a central winding marble stairway. This courtroom had exquisite woods with intricate carvings, which of course I didn't have time to render. The proceedings got underway, and I got to experience at least a little bit of what courtroom artists are up against when they are trying to capture a scene amidst a cast of changing players. I have to say, it was really a lot of fun to do this, though I'm not sure I'd want to do it under the kinds of pressures that the courtroom artists endure. There are lots of things I'd plan differently the next time around, such as leaving spaces to put in figures that would move into various positions in the room, then pop them into those spots as the situations present themselves. This second sketch was done over a blue wash, which was a little bit dark in terms of being able to present my light values. That's something I'll have to take into consideration next time, especially if I plan to use watercolor over it. I resorted to a little white gouache to reclaim some lights, like on the table tops. It also would have been nicer to work a larger size for this; however, I was trying to remain inconspicuous, so the double spread of a 5.5x8.5" book was perfect for a few minutes of stealth sketching. This has been a long couple of months away from my art. My husband's uncle passed away, my daughter was in the hospital, and my younger sister died suddenly. I dropped everything, and spent my time helping to pick up the pieces and reassemble our lives as best we could. My sister's funeral has not yet been held, but I'm at a point where I can start to pick up a brush again from time to time. I've also done some sketches over the past couple of months that I'll be posting as I get computer time. My sister Liz loved cats. This Royal Doulton sculpture was one that I inherited from her. I set it up in a still life with some tulips given to me by my friend Patricia, and some luscious pears. The painting is mostly watercolor, with some gouache, metallic Gelly Roll pen, and dark gray brush pen. It was done in card format on a folded piece of Stillman & Birn Zeta paper --- a fabulous 180 pound paper with a smooth surface. Many thanks to all my friends and viewers who have sent your condolences, thoughts, and good wishes our way. You are all very much appreciated. Today, I'm not bringing you a sketch. Instead, I'd like to direct your attention to the Golden Video Library. 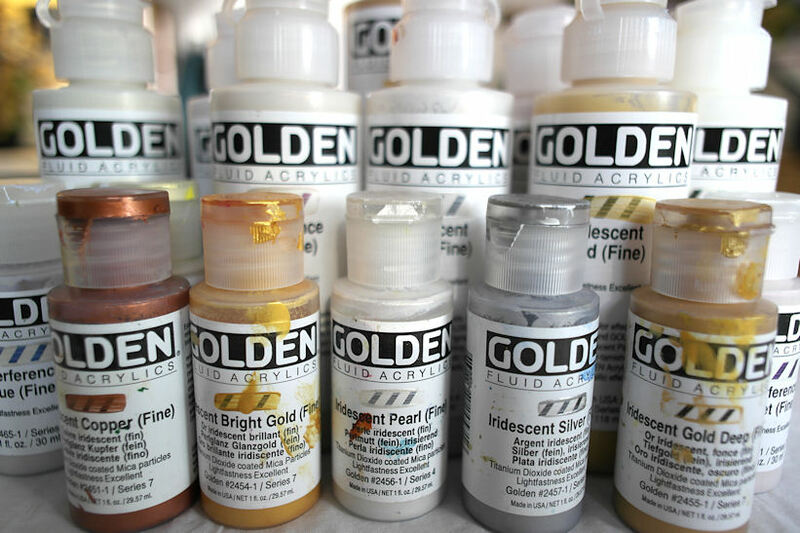 I'm always surprised by how few artists know about this fabulous resource that the Golden Paint Company has created. 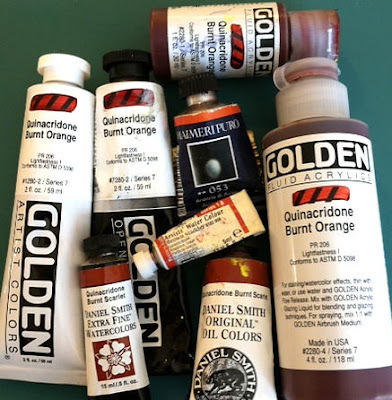 I am often asked by friends and blog visitors how to apply an isolation coat or varnish, or what the best way is to prepare painting surfaces, or characteristics of specific mediums. These videos explain and demonstrate these things and more, far better than I can! Do yourself a favor and take some time to explore the video offerings they've posted on their website. It may give you ideas for new things to try, ways to use materials you may already have, or better ways to achieve your painting goals. Golden also has a YouTube channel, but I like going to the library on their website because all the videos show on the page together. Enjoy! 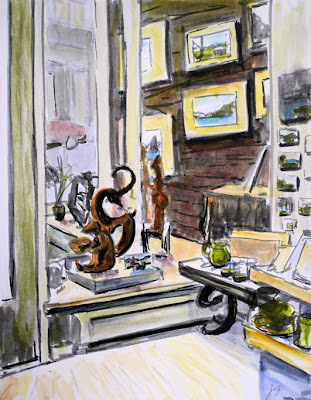 This sketch was done while at RiverWinds Gallery last weekend. They have such beautifully arranged displays, and the gallery is an inviting place to spend the afternoon. 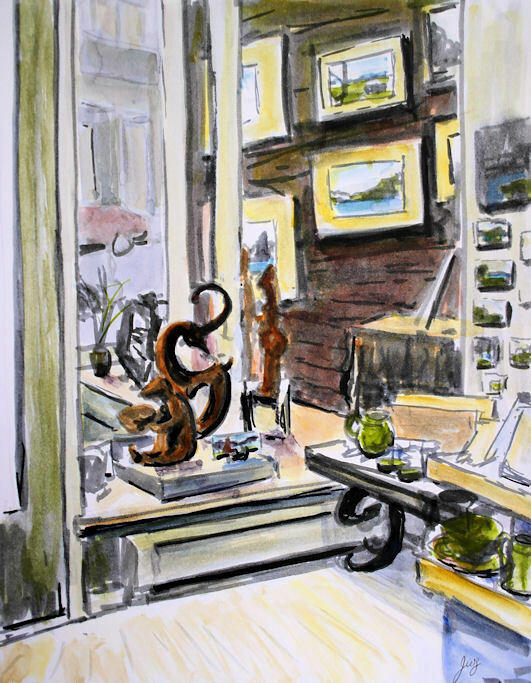 Many thanks to gallery owner Virginia Donovan for a wonderful day. I started out this sketch with just the monochrome Pitt Cool Grey Big Brush Pens. Gallery visitors thought I should leave it as the monochrome version, but the color junkie in me won out and I added color to it. Then they all liked the color version better! You can see the monochrome version by clicking here. Which do you prefer? The paper is the new 180 lb. smooth Zeta paper from Stillman and Birn. I love the way pens and markers glide over the surface! We should be able to get sketchbooks of it in another month or so. Can't wait! I've tried a lot of new products this year. Some I loved, some I hated, and some were okay but probably won't become staples in my studio. A few I know I'll be using for many years to come. These are my favorite items new to the art market this past year. You can click the images to see larger, clearer photos. I have adored the new, extra heavyweight sketchbooks that Stillman and Birn manufactured. The 180 lb. paper takes everything I've thrown at it. These sketchbooks go everywhere with me and I can have confidence that no matter what medium I decide to use in my travels, it will work on this surface! It's such a joy to be able to work across the spread (since the books open completely flat) and on both side of the page with no show-through or buckling. I can travel with a book half the size, and in using the full spread, I have double the space. They're amazing. Stillman & Birn has also made a new paper called Zeta. It should be available in hardbound and wirebound books very soon. I've been able to test drive some loose sheets of the new paper, and I am chomping at the bit to get my paws on a book of it! Since I love fountain pens, the very smooth, plate-like surface of Zeta is perfect for my pen and ink work. Nothing shows through this 180 lb. paper to the other side, and the heavy weight and abundant sizing enable it to handle wet media too. I've always loved my larger TWSBI, but it's a bit heavy in my hand. 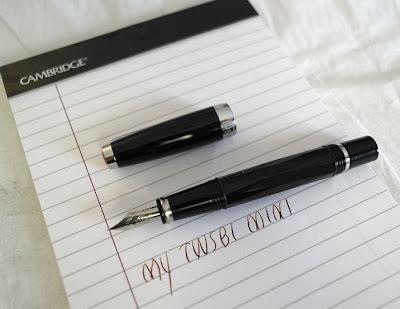 I got a fine point TWSBI Mini when they came out a month or two ago, and it's the smoothest fine point I've ever written with. If you have a large hand, you may find the Mini a bit small, even when the cap is posted on the barrel of the pen. But for me, it's absolutely perfect. I couldn't be happier. It goes everywhere with me. I find it comfortable in my hand, it writes like a dream, and holds a ton of ink. It is currently loaded with Private Reserve Copper Burst. I hope you'll give some of these new products a try. Many new items hit the art supply market every year, and it's hard to get around to sampling everything, but I do feel the new Stillman & Birn products and the TWSBI Mini are worthy of rave reviews from among the large number of new materials I sampled during the year. In the past year or so, I've also been working with a lot of products that are not new to the market, but are new to me. 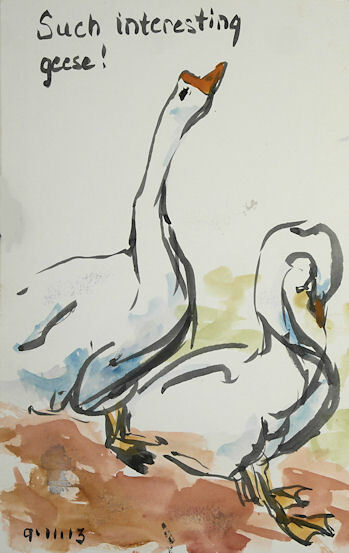 Some of them have become favorite painting, drawing and sketching materials. I'll be featuring those in the last installment of my "Best of the Year" series, so stay tuned. You can see "Best of the Year Part I" on this link. Happy 2013 to all my viewers! I'd like to start off the new year by sharing my favorite discoveries and new products of the past year. Some are new to the market, while others are things I'd just not explored before and hope to work with more in the year to come. I hope that some of you will enjoy using them too. Today's post is about my favorite pigment of 2012: PR206. It is actually a Quinacridone red, but looks more earthy than many of the Quins. 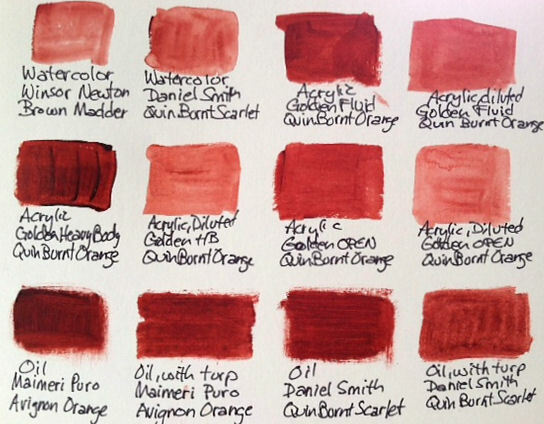 This pigment gives me a warm red, transparent earth color. It can easily be mixed with earthy yellows to yield the equivalent of a transparent red oxide. When mixed with ultramarine blue, it creates a dark, muted violet. 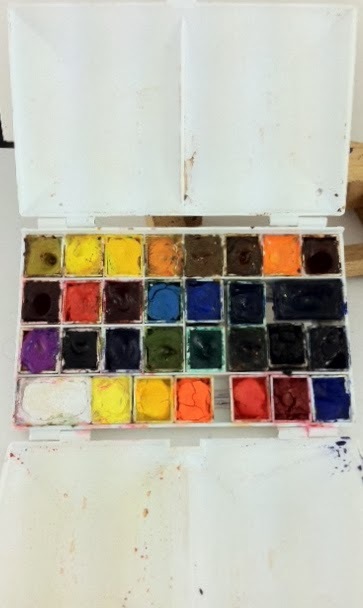 I started using this color in my watercolor palette after taking a class with David Taylor. 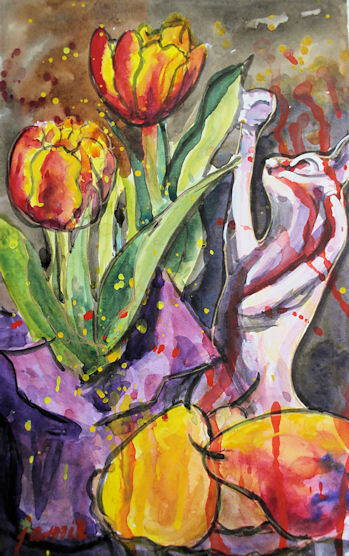 It became such a staple in my palette that I searched for the same pigment in oils and acrylics. The past few years have found me working transparently a lot more in both oils and acrylics, so this pigment was a natural fit --- especially for underpainting and glazing. I did several paintings using it as my only red. The pigment goes by many different names, so you need to look carefully for the pigment number, which is PR206. 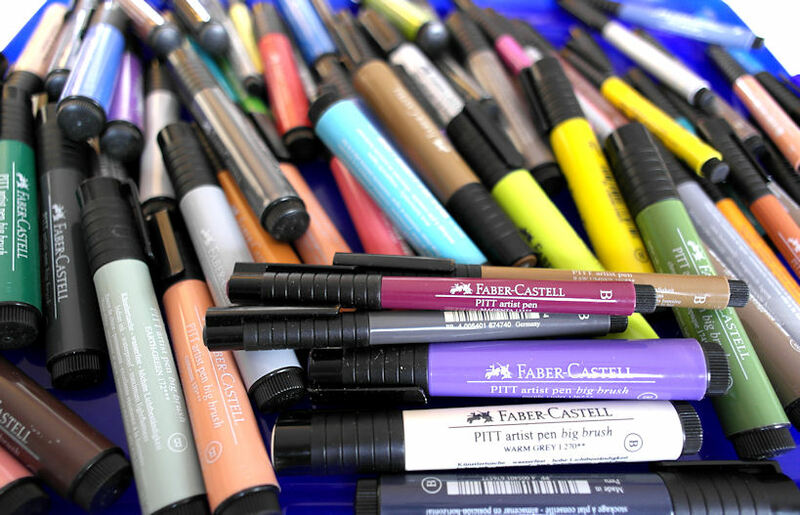 Here are a few manufacturers that make it for different mediums. Click here to see Best of the Year, Part II.